The refugee crisis in Europe that culminated in a harrowing photo of a drowned Syrian toddler on a Turkish beach has evolved from simmering in the back of the public’s consciousness to taking center stage. “Research is clear: You give people numbers, such as 200,000 thousand people have been forced to leave their homes due to war, persecution or oppression, and they don’t sympathize. However, you give them one story with the photo of one dead baby, and the conflict has a face,” noted Kyeonghi Baek, associate professor of political science at Buffalo State and coordinator of the college’s new international relations major, along with its international relations minor. This situation recently prompted President Barack Obama to pledge taking in 10,000 displaced Syrians over the next year —a huge increase over the fewer than 2,000 last year. Baek talks about this shift in sentiment, along with the resistance of Europeans to house the continuing flux of refugees and some of the reasons behind the refugee crisis. Even though the war in Syria began in 2011, she said, the devastating situation has escalated since Bashar al-Assad’s regime started targeting civilians; many have been murdered. As a result, millions have fled to Turkey, Greece, Germany, and beyond, seeking refuge. One of Baek’s students works as a staff writer for an English newspaper in Cairo, Egypt, and shared some new perspective on the matter with Baek in this article. At the same time, many European countries are doing what they can to keep refugees out. She noted that the United States has been the biggest monetary contributor to Syria among countries in United Nations. And despite opposition from some U.S. politicians, Baek said the United States is poised to be generous and welcoming, though it will take a while for the refugees to get here. This influx will trickle down locally. Baek said two Buffalo refugee organizations are preparing for the arrival of about 800 Syrians. While the United States and Europe deal with the aftermath, until the source of the conflict is addressed, problems will continue to escalate, she said, and refugees will continue to pour out. 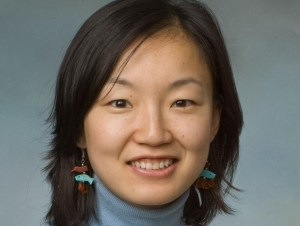 A native of South Korea, Baek earned her doctorate in political science from the University of Mississippi and joined the Buffalo State Political Science Department in 2008. Her research interests include international and local conflict, public opinion and voter behavior, and foreign policymaking. To contact her, call (716) 878-6227 or email baekk@buffalostate.edu. The bachelor’s in international relations was introduced at Buffalo State in 2014. It is the only such bachelor’s degree offered by a public university in Western New York. Already, Buffalo State’s international relations majors have landed internships in New York City and Albany, New York, and Cairo, Egypt.